Imaging assays: what can be measured? The ability to measure biochemical and molecular processes underlies progress in breast cancer biology and treatment. These assays have traditionally been performed by analysis of cell culture or tissue samples. More recently, functional and molecular imaging has allowed the in vivo assay of biochemistry and molecular biology, which is highly complementary to tissue-based assays. This review briefly describes different imaging modalities used in molecular imaging and then reviews applications of molecular imaging to breast cancer, with a focus on translational work. It includes sections describing work in functional and physiological tumor imaging, imaging gene product expression, imaging the tumor microenvironment, reporter gene imaging, and cell labeling. Work in both animal models and human is discussed with an eye towards studies that have relevance to breast cancer treatment in patients. The ability to assay cancer biological features is key to advances in both the basic and clinical science of breast cancer. Advances in our ability to assay molecular processes, including gene expression, protein expression, and molecular and cellular biochemistry, have fueled recent advances in our understanding of breast cancer biology and our ability to treat breast cancer in patients. Most assays require sampling of cells or tissues to perform the measurements. Thus, the cell culture system, animal model, or patient must be perturbed in order to perform the assay. This requirement makes serial assays over time more difficult and leaves open the possibility that the assay itself may change the state of the system being measured. The ability to measure biological processes without perturbing them would be highly desirable and would offer complementary information to that obtained by most traditional assay methods. Advances in both technology and cancer science have led to the ability to perform non-invasive molecular assays. An example is the use of reporter genes whose expression results in the production of material such as green fluorescent protein or luciferase that can be detected without tissue sampling . Another advance, applicable to the entire range of biological systems from cell culture to human, is molecular imaging [2, 3], which is the focus of this review. Imaging has traditionally relied on structural and anatomic features to detect breast cancer and determine its extent . This traditional form of imaging, often termed anatomic imaging, has made an important contribution to cancer care, and is widely used in the detection and staging of breast cancer patients using methods such as X-ray mammography and computed tomography (CT). More recently, imaging has expanded to include the ability to image regional biochemistry and molecular biology, often termed molecular imaging . The focus for molecular imaging is not structure, but rather regional biology. Quantitative analysis is an important feature of this type of imaging, for example, the ability to measure regional tumor receptor expression [5, 6]. As such, molecular imaging can be considered an in vivo assay technique, capable of measuring regional tumor biology without perturbing it. This makes molecular imaging a unique tool for probing breast cancer biology, complementary to traditional assay methods, and a potentially very powerful tool for translational science. In the sections that follow, imaging methods used in molecular imaging are reviewed, the biological processes that can be assayed are discussed, and selected examples of translational science using molecular imaging are reviewed. The focus is on in vivo imaging of animal models and patients. It is important to keep in perspective inherent differences in capabilities between tissue-based assays and in vivo assays using molecular imaging. Imaging is non-invasive and, therefore, better suited to serial assay. In addition, imaging typically surveys the entire animal or patient and, therefore, avoids sampling errors that can occur for assays that require tissue sampling, especially when there is significant tumor heterogeneity. However, while sample-based methods can assay many different processes at once – for example, the expression of an array of genes  – imaging can typically sample at most a few processes at the same time. Also, while it is possible to 'batch' process for many samples at the same time, imaging needs to be performed one subject at a time. Furthermore, the need for sophisticated equipment and imaging probes makes imaging typically more expensive than sample-based assays. These last two factors limit the number of subjects that can be studied by imaging compared to sample assays. In general, imaging methods are complementary to assay-based methods and best used to explore breast cancer biology in intact animal models or patients, or to image the effects of therapeutic intervention on in vivo tumor biology. The imaging modalities most commonly used in molecular imaging are listed in Table 1. Common among these modalities is the ability to image functional and molecular tissue properties such as perfusion, metabolism, and receptor or oncogene expression [5, 8–12]. This section provides a brief description of each modality, along with its advantages and disadvantages. Magnetic resonance (MR) relies upon the interaction of atomic nuclei with radiofrequency signals in the presence of strong magnetic fields. MR imaging (MRI) offers high spatial resolution and functional contrast agents using magnetic elements such as Gd and Fe . Breast MRI using non-specific contrast agents such ad Gd-DTPA has become an important part of clinical breast cancer , and there have been some notable recent successes in the use of breast MRI for breast cancer detection . More detailed and quantitative approaches to dynamic contrast enhanced (DCE) breast MRI have been increasingly used to examine tumor perfusion and capillary permeability as an indicator of tumor angiogenesis [15–17]. More specific and targeted MRI agents have also been developed and undergone preliminary testing ; however, the range of possible molecular agents is somewhat constrained by the need to include a magnetically active atom such as Gd or Fe. Recent advances in pulse sequences and image acquisition have led to the ability to measure other tissue properties, such as water diffusion, that can provide information on cellularity and interstitial transport without the need for contrast [19, 20]. An advantage of MRI is its high spatial resolution and image quality, especially with increasing magnetic field strength, making it applicable to both small animals and patient imaging. Limitations include the cost of the imaging system and the thus far somewhat limited range of imaging probes that serve as MR contrast agents, although new approaches tested in pre-clinical models will provide increased capabilities for animal research and may be able to be translated to patient studies . MR spectroscopy (MRS) takes advantage of the ability of nuclear magnetic resonance to identify specific chemical signatures and measures the regional concentrations of biochemical species, using methods similar to those developed for basic chemical assays . Much of current work in patients uses hydrogen spectroscopy; however, spectroscopy for other biologically relevant nuclei, such as phosphorus or sodium, is also possible . MRS can quantify the concentration of prevalent biochemical species without perturbing the system being imaged, and without the need for imaging contrast administration. MRS has considerably more limited spatial resolution compared to MRI; however, recent advances in magnetic field strength and MRS technology have yielded the ability to generate three-dimensional MRS concentration maps (MRS images, MRSI) with resolution on the order of 1 cm or less . Recent studies suggest that changes in local metabolites with therapy may provide a very early indicator of breast cancer response . MRS has the advantage of being able to directly quantify molecular species without the need for contrast, with the disadvantages of more limited spatial resolution and the need for relatively high abundance to be able to reliably quantify regional biochemical concentration. It shares the need for relatively expensive equipment with MRI, and in fact, requires fairly high field strength, typically 3 T or more, to be effective for animal and patient breast studies . Radionuclide imaging relies on the use of imaging probes, typically termed radiopharmaceuticals, tagged with radioactive nuclei . Position-sensitive radiation detectors identify emitted photons and generate images of regional radiopharmaceutical concentration. This imaging approach, sometimes called nuclear medicine, has traditionally relied on gamma-emitters such as 99mTc or 131I to form images in a technique often termed single-photon computed tomography (SPECT)). 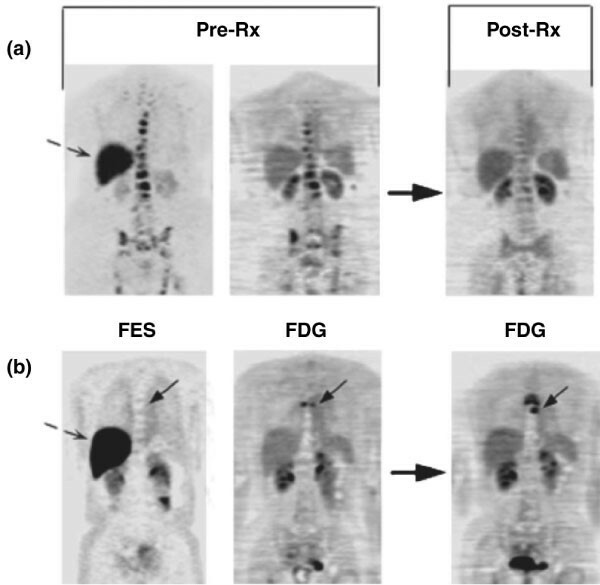 Somewhat more recently, advances in both instrumentation and radiochemistry have led to the ability to image positron-emitting nuclei, such as 11C and 18F, in a wide range of molecules in an approach known as positron emission tomography (PET) . Compared to SPECT, PET offers the potential for better spatial resolution, more accurate image quantification, and a wider range of possible imaging probes; however, both PET and SPECT have made notable contributions to breast cancer clinical care and research [5, 23, 24]. The chief advantage of radionuclide imaging is the ability to measure probe concentrations in the nanomolar, and even picomolar, range, leading to the ability to measure even the most sensitive molecular processes without perturbing them. A wide range of radiopharmaceuticals has been developed to image diverse aspects of breast cancer biology . Disadvantages include more limited spatial resolution and the need to produce and distribute relatively short-lived imaging probes. Recent development in dedicated imaging devices for small animals  and breast-specific imaging  has overcome some of the limitations in spatial resolution; however, inherent spatial resolution is less than for other methods such as CT or MRI. The combination of PET or SPECT with X-ray CT (PET/CT or SPECT/CT) yields co-registered molecular and anatomic images and the opportunity to image molecular biology and anatomy simultaneously . Radionuclide imaging probes and instrumentation are relatively expensive, with costs comparable to MRI. One of the oldest forms of imaging is optical imaging, using visible light to generate images. In many ways optical imaging is the earliest form of cancer imaging, in the form of light microscopy. Recent advances in instrumentation, computational algorithms, and imaging probes have led to new capabilities in optical imaging of living organisms, including small animal models and patients . A variety of optical methods have been developed that can yield in vivo images with high contrast, and, in some cases, considerable detail, down to the microscopic level. Methods can measure regional biology such as vascularity and blood volume using inherent tissue optical properties , or take advantage of an ever increasing array of optical probes to image specific molecular processes . Low cost, portability, ease of use, and wide availability of imaging probes are key advantages of optical imaging. Its chief disadvantage is relatively limited tissue penetration. Thus, while optical imaging has become an essential tool for breast cancer animal research , its use in patients has been more limited. While promising early studies in breast tumor imaging point towards future clinical application , optical imaging has been mostly confined thus far to the pre-clinical setting, where it is an important tool for breast cancer research. Ultrasound imaging works by using acoustical transducers to send and receive ultrasound frequency energy and generate three-dimensional images from either reflection or through-transmission . Conventional ultrasound provides high-resolution anatomic detail, and breast ultrasound plays an important role in breast cancer diagnosis . Doppler technology also provides information on tumor vascularity, and with the advent of microbubble contrast agents, tumor perfusion . Recent advances in imaging technology  and the development of targeted microbubble contrast agents hold promise for molecular imaging . The portability and relatively low cost of ultrasound make it an ideal tool for both animal and patient imaging, and the ability to measure molecular processes will make ultrasound a valuable tool for breast cancer research. Disadvantages include some operator dependence in image acquisition and interpretation, and some challenges in developing molecularly targeted micobubble contrast agents. Other imaging modalities such as X-ray radiography and X-ray CT play an important role in structural imaging, but are more limited for molecular imaging. Dynamic contrast CT can be used to measure tissue perfusion, similar to DCE-MRI, with the disadvantage of relatively high radiation exposure. Other techniques are also being investigated , but are at relatively early stages of development and not discussed in detail here. Molecular and functional imaging that can measure a range of cancer biological features have been developed and validated. These capabilities are reviewed in this section, broadly dividing categories of imaging assays into functional/physiological properties, protein expression (with an emphasis on tumor receptors), the tumor microenvironment, and tumor gene expression. Both applications to animal models  and patients  are reviewed. Imaging is ideally suited to measuring in vivo tumor biology related to basic physiological properties such as perfusion, metabolism, biosynthesis, cell proliferation, and cell death. In fact, many of these processes are difficult to assay by tissue sampling; therefore, imaging provides a unique and quantitative measure of these properties that can only be measured in vivo. Tumor perfusion is one of the earliest physiological properties to be measured, and advances in methodology have led to increasingly quantitative approaches. The most physiologically robust and quantitative measures of tumor blood flow use freely diffusible imaging probes, where blood flow can be inferred from the time course of probe uptake and washout, adapting methods developed for measuring cerebral blood flow . One example is the use of 15O-water to measure tumor blood flow by PET, which yields measures of tumor blood flow in ml/minute/g that have been validated against microsphere methods . Water PET imaging has been shown to be effective in monitoring breast cancer response, and changes in tumor perfusion with treatment measured by water PET are predictive of survival . Diffusable optical probes may also be used for this purpose . Considerable effort has been devoted to the quantification of tumor perfusion and tumor capillary permeability using radiographic and MRI contrast agents [40–44]. These agents have somewhat limited permeability across capillaries; therefore, their in vivo kinetics are dependent upon both blood flow and capillary permeability. Increasingly sophisticated image acquisition and analysis methods, for DCE-MRI in particular, have led to the ability to measure regional breast cancer perfusion and capillary permeability in both animal models and patients . Novel MRI contrast agents, including macromolecular agents, may offer additional capabilities . These methods have been applied in early trials of anti-angiogenic therapy breast cancer and have yielded insights into the nature of response . Standardized methods for DCE-MRI for clinical trials have been proposed . Tumor perfusion imaging requires good vascular access for prompt and reliable delivery of the imaging probe, and has therefore been more challenging in animal models; however, recent work using inhaled radionuclide agents hold promise for small animal research applications . Tumor metabolism has also been widely studied by imaging. Perhaps the best known example is the measurement of regional glucose metabolism using 18F-fluorodeoxyglucose (FDG) PET, which is now routinely used in breast cancer clinical practice to determine the extent of tumor spread and assess response to treatment [5, 25]. This method can also be readily applied to animal models , and can yield detailed physiological information through kinetic analysis of dynamic images [49, 50]. Other PET radiopharmaceuticals can be used to measure other aspects of metabolism, including regional oxygen consumption and fatty acid metabolism . MRS has also been quite useful in measuring metabolism through 1H spectroscopy to measure levels of lactate and other biochemical species key in metabolism  and also through phosphorous spectroscopy to measure concentrations of adenine nucleotides as an indicator of energy metabolism . Other studies in a variety of tumors, especially in brain tumors and prostate cancer, have shown the ability to measure biochemical species in a variety of metabolic pathways – for example, membrane lipids (choline) and metabolic intermediates (citrate) – and have provided improved diagnosis, early measures of response, and insights into pathophysiology [53–58]. The chemical composition of the breast, particularly its high lipid content, provides some challenges for MRS, but recent progress in magnet field strength, acquisition, and processing methods may offer improved capabilities in breast cancer . Aberrant cellular proliferation is a fundamental property of cancer, including breast cancer . Labeled compounds such as 14C- or 3H-thmyidine have been an important method for measuring cellular proliferation through sampling, dating back over 40 years . Early work used PET and 11C-thymidine to measure tumor proliferation by imaging, and quantitative imaging approaches were validated against in vitro assay gold standards . However, the short half-life of 11C (20 minutes) and the extensive in vivo metabolism of thymidine limit the feasibility of this approach for both animal and patient imaging. More recent work using thymidine analogs labeled with 18F (half-life 109 minutes) have been developed and undergone considerable advances in recent years [63, 64]. The most promising of these had been 18F-fluorothymidine (FLT), with notable recent results in both animal and patient breast cancer imaging [65–68]. FLT PET appears especially promising for measuring the early effects of therapy on breast cancer growth, as suggested by recent studies by Kenny and colleagues . This imaging approach had also been validated against in vitro assay of proliferation (reviewed in ) and is poised for greater use in both animal research and human clinical trials. Methods for imaging cell death have also been investigated, but are at an earlier stage of development. Many of these have been based upon an extension of Annexin V staining in vitro, which indicates apoptotic cells through binding to phosphotidyl serines . The molecules are found only on the inner surface of plasma membranes and, therefore, normally not accessible to Annexin V, a peptide, for binding. However, during apoptosis, these molecules are transiently exposed to the extracellular space, allowing binding of Annexin . The earliest studies used 99mTc-annexin and SPECT imaging to measure apoptosis in animal models and patients [69, 70]. More recently, methods for annexin-based apoptosis imaging have been developed for PET, MRI, optical imaging, and ultrasound . One limitation of this approach has been the transient nature of phosphatidyl serine exposure during cell death, resulting in fairly limited signal for imaging . Other approaches targeted to other aspects of the apoptotic cascade are being investigated . An alternative, but less specific approach has been to use MRI measures of water diffusion through the extracellular space as an indirect measure of tumor cellularity [19, 73]. Increases in the diffusion coefficient, as an indicator of a decrease in tumor cellularity, have correlated with measures of apoptosis in animal models  and response to therapy in early patient studies [20, 73]. This method has the advantage of being available using existing MRI instrumentation for both animal and patient imaging without the need for imaging probes, but provides a relatively indirect measure of cell death. Several methods can also measure biosynthesis as an indicator of tumor growth, with approaches targeted to protein synthesis and membrane synthesis. The uptake of labeled amino acids, such as 11C-methionine, has been shown to correlate with tumor growth, and changes in uptake provide an early indication of breast cancer response to therapy . This approach, however, is limited by the complex nature of amino acid metabolism pathways, making it difficult to measure protein synthetic rate versus amino acid transport and metabolism . Artificial amino acids have also been tested as indicators of amino acid transport . Proliferating tumor cells also engage in enhanced lipid biosynthesis to provide material needed for cellular membranes . This process can also be assayed through molecular imaging using several different methods. Spurred by results in brain tumor imaging , MRS studies of breast cancer have shown increased choline pool sizes to be a feature of breast malignancy [9, 78]. Interestingly, changes in the choline concentration measured by MRS early in treatment appear to be a marker for early response to therapy, as early as 24 hours after treatment with chemotherapy . These exciting early findings are now being tested in a large prospective cooperative group trial. Lipid metabolism can also be studied by PET using either 11C or 18F labeled choline, or 11C-acetate , which enters lipid synthesis from the tricarboxylic acid (TCA) cycle via fatty acid synthetase. Fatty acid synthetase has been show to have increased activity and expression in cancer and may be a target for therapy . This approach has shown considerable promise in other tumors such as prostate cancer , including therapeutic response , but has not been applied to the same extent in breast cancer . The ability to measure the expression of specific proteins that are gene products associated with breast cancer has led to important advances in breast cancer treatment. Examples include the expression of estrogen receptors (ERs), a target for endocrine therapy , and HER2, also increasingly a target of tumor-specific treatment . Molecular imaging has also been applied to measuring specific protein expression [6, 24]. Advantages of imaging include its non-invasiveness, the ability to measure receptor expression in the entire disease burden and thus the ability to avoid sampling error that can occur with heterogeneous receptor expression, and the potential for serial studies of in vivo drug effects on the target. A very practical consideration is that imaging can assess receptor expression at sites that are challenging to sample and assay, for example, bone metastases, where de-calcification can make assay of tumor gene products challenging. Imaging protein expression, particularly tumor receptors, poses some unique challenges. For receptors, imaging results can be quite sensitive to the molecular quantity of the imaging probe needed to generate the image. Most receptors have high affinity for their ligands and are active at micromolar or nanomolar concentrations of the ligand. Even small molar quantities of the imaging agent may saturate the receptor and limit the ability to visualize receptor expression [86, 87]. For this reason, molecular imaging of tumor receptors has been most successful to date with radionuclide imaging, PET and SPECT, where it is possible to generate images with nanomolar or picomolar amounts of the imaging probe. For larger molecules, like peptides and monoclonal antibodies, other labels suitable for optical, MR, and ultrasound imaging are possible ; however, for small-molecule receptor imaging agents, such as labeled steroids for steroid receptors, radionuclide imaging appears to be the only feasible approach. The most work to date in this area of breast cancer research has been done for steroid receptors [6, 88]. Considerable efforts have gone into the development of radiopharmaceuticals for ER imaging, as reviewed in [88–90]. Although a variety of ER imaging agents have been tested, and continue to be developed and tested, the most successful ER imaging radiopharmaceutical to date is 16 alpha-[18F]-fluoro-17 beta-estradiol (FES) [87, 91]. FES has binding characteristics similar to estradiol for both the ER and the transport protein SHBG [92, 93]. It can be synthesized with sufficient specific activity that high-quality patient images can be made with injections of less than 5 μg of FES . Regional estrogen binding is readily quantified by FES PET, and FES uptake has been validated as a measure of ER expression in breast tumors against ER expression assay of tissue samples by radioligand binding  and immunohistochemistry . FES uptake is readily visualized and quantified in primary and metastatic breast cancer . It can identify heterogeneous ER expression, for example, loss of ER expression in metastases arising from ER-expressing primary tumors [94, 97]. The level of FES uptake has been shown to be predictive of response to endocrine therapy [94, 98], including heavily pre-treated patients (Figure 1). Serial FES PET can also measure the pharmacodynamic effect of drugs on estradiol binding to the ER [98, 99], yielding insights into determinants of drug efficacy. While PET ER imaging had been successful, efforts to image progesterone receptor (PR) have been less successful [100, 101]. In a study of the PR imaging agent 21-[18F]fluoro-16 alpha-ethyl-19-norprogesterone, uptake was seen in some tumors, but the level of uptake did not correlate with the level of PR expression. This may be in large part due to the relatively low affinity of progestins for the PR, with binding affinities that are orders of magnitude lower than those of androgens and androgen receptors and estrogens and ERs . As such, relatively high non-specific binding compared to specific binding of imaging probes may limit their utility for PR imaging. Later studies also showed that the radiopharmaceutical tested was rapidly metabolized in human to a metabolite with poor receptor binding , a finding that was not predicted by pre-clinical models. Efforts to develop effective PR imaging agents continue . HER2 (ErbB2) expression in breast cancer has become an important indicator of prognosis and an increasingly important target for therapy . Recent efforts have focused on imaging HER2 expression in breast cancer. The most success and largest number of studies to date used imaging probes based upon immune recognition to image HER2 expression. Specific imaging probes based on radiolabeled antibodies or fragments [105–109], or novel constructs such as affibodies [110, 111], have shown success in early studies. Studies using a 68Ga-labeled F(ab')2 fragment of trastuzumab by Smith-Jones and colleagues [112, 113] demonstrated the feasibility of measuring regional HER2 expression in murine animal models. The imaging results nicely demonstrated alterations in HER2 expression accompanying experimental therapy using HSP90-directed agents (geldamycin analogs) to disrupt protein chaperoning and reduce HER2 expression [112, 113]. Studies using 131I- or 111In-labeled trastuzumab have demonstrated the ability to image tumor expression of HER2 and tumor and normal tissue accumulation of trastuzumab [108, 114, 115], although there has been some controversy about the significance of uptake in normal tissues prone to trastuzumab toxicity, such as the heart [108, 115]. Promising early patient studies have also been presented for 89Zr-labeled trastuzumab . For imaging using larger molecules like monoclonal antibodies and fragments, as in the case of HER2 imaging, an even wider range of probes (and therefore imaging modalities) may be possible, including optical, ultrasound, and MR-based probes [117–122]. Koyama  demonstrated specific fluorescence imaging of HER2-expressing lung metastasis in an animal model. Others have used near-infrared imaging of HER2 expression in vitro using gold nanoshell bioconjugates  and fluorochrome labeling . Pre-clinical studies using specific antibodies conjugated to gadolinium or magnetic nanoparticles demonstrated the feasibility of MRI antibody imaging in cells  and animal models . Early studies of nanoparticle-based ultrasound probes conjugated to HER2-specific antibodies have demonstrated the feasibility of this approach in early in vitro studies and simulated in vivo studies [119, 127]. The ability to image with multiple modalities is particularly helpful for translating research from the pre-clinical to clinical setting. For example, optical imaging is extremely valuable for small-animal studies, but has limited utility in patients due to poor tissue penetration for imaging deeper structures. The ability to translate optical imaging findings into PET or MRI imaging in patients, seen in early work for HER2 imaging, holds great promise for facilitating translational research. Molecular imaging provides a unique opportunity to image the tumor microenvironment, which is challenging by more invasive means. Tumor hypoxia, an important factor mediating cancer aggressiveness and therapeutic resistance [128, 129], has been widely studied by imaging, with some recent studies in breast cancer . 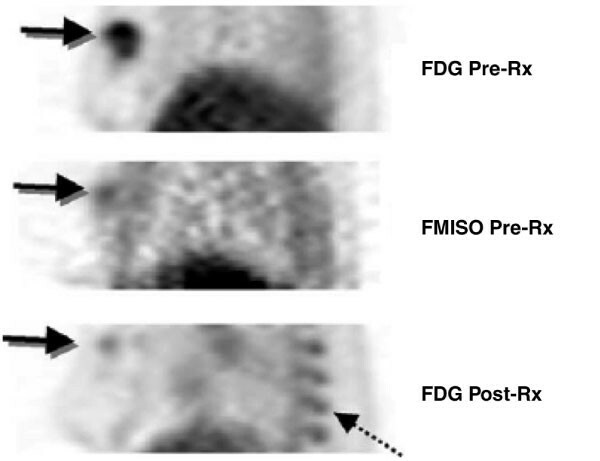 Most work has been done using PET imaging and the agent 18F-fluoromisonidazole (FMISO) (Figure 2); however, other PET hypoxia probes have been developed and tested . Other hypoxia imaging methods based upon MRI and optical approaches are at an earlier stage of development, but appear promising [131, 132]. Tumor vasculature plays a key role in tumor growth and metastasis, and is also important in the delivery of systemic therapeutic agents. Imaging of tumor vasculature and the delivery of nutrients and drugs has also been an area of interest. Tumor perfusion and capillary transport provide an indirect measure of tumor vasculature and can be imaged by DCE-MRI and PET, which have been effective in measuring tumor response in early studies [16, 38, 39]. In addition, targeted imaging probes can non-invasively and specifically assess tumor neo-vasculature. PET probes based upon specific labeled peptides that bind to integrins expressed in neovessels have been studied in animals and tested in humans [133, 134]. MRI probes have been developed and are at an earlier stage of testing . Such agents may be especially helpful for therapies directed at tumor neo-vasculature, such as bevacizumab. Imaging methods to measure nutrient and drug transport have also been developed and tested. For example, the SPECT agent 99mTc-sestamibi, developed for myocardial perfusion imaging, has been shown to be a substrate for the drug efflux transporter P-glycoprotein . Studies in the setting of pre-surgical chemotherapy showed that the uptake and retention of 99mTc-sestamibi was predictive of response to chemotherapeutic agents that are substrates for P-glycoprotein, such as epirubicin . Somewhat more specific and quantitative probes of P-glycoprotein transport have been developed for PET imaging [137–139]. Macromolecular MRI contrast agents are undergoing testing in patients  and may be useful for measuring the delivery of therapeutic agents, such as trastuzumab, that are large molecules where capillary and interstitial transport may pose significant barriers. Advances in cancer biology have led to an increasing array of approaches to breast cancer therapy, including immunotherapy and gene therapy. These advances in turn lead to the need for increasingly sophisticated approaches for imaging to monitor these treatments. An increasing body of work in molecular imaging has therefore been devoted to imaging approaches capable of imaging gene expression and cellular trafficking and survival in vivo [12, 82]. Paralleling work done in reporter systems for cell culture, imaging reporter systems have been developed and are increasingly used in animal model research [141–143]. Reporter imaging can use optical approaches, with reporter genes expressing optically detectable molecules such as green fluorescent protein and firefly luciferase. Optical approaches provide inexpensive, readily available methods for imaging reporter gene expression, and are widely used in current research . Radionuclide methods have also been developed and widely tested in animal models . The most popular approach has been based upon the use of viral thymidine kinase as a reporter gene, combined with labeled probes that are specific substrates for phosphorylation by viral thymidine kinase [145, 146]. This results in probe trapping and high-contrast, readily quantifiable images . A variety of other radionuclide reporter systems have been used, including the NaI symporter and radioiodine, receptor expression (for example, dopamine) and receptor binding ligands, and alternative metabolic substrates [148, 149]. Some progress has also been made in MRI reporter systems [150, 151]; however, this work is at an earlier stage than optical and PET approaches. The development of therapeutic approaches mediated by specific cells – for example, immunotherapy – has generated increasing interest in cell labeling and imaging. Cell labeling can be done using non-specific probes, such as 111In-oxine and non-targeted iron oxide particles for use in SPECT and MRI, respectively ; however, this approach often requires isolation of the cells to assure that only the desired cells are imaged. In cell therapy where molecular manipulation is possible, cells engineered with reporter systems can also be used to provide specific cell labeling that does not require isolation of cells and that remains with the cells through subsequent generations, unlike most non-specific methods . For immunotherapy, the generation of reporter systems that do not themselves engender an immune response is a challenge and represents an active area of research . Advances in molecular biology create new opportunities for understanding and treating breast cancer, and also create new needs for increasingly sophisticated and quantitative assays. Advances in both technology and molecular biology have led to the capability for molecular imaging, a method for non-invasive and regional assay of in vivo tumor biology. While some molecular imaging methods, most notably SPECT and PET, have begun to be used in patients, many molecular imaging approaches have, as yet, undergone only early testing at a pre-clinical stage. Some methods, such as optical reporter gene imaging, have already become an important part of basic research in animal models. Other approaches, such as PET imaging of tumor receptor expression, look very promising in early patient studies, but have yet to make it to larger clinical trials or clinical practice. Only a relatively few approaches, such as FDG PET, have made their way into clinical practice. Molecular imaging offers a very powerful tool for translating basic science into clinical benefit. This can happen in several ways. Demonstration that molecular pathways discovered in animal models have relevance to human breast cancer is a critical aspect of breast cancer translational research. Molecular imaging offers a way to assess and quantify pathways in both animal models and patients in order to verify that the pathways behave similarly in both cases. In addition, molecular imaging used to guide drug development and pre-clinical testing can be applied to early clinical studies to provide proof-of-concept, early evidence of efficacy, and a pharmacodynamic measure by which to optimize dosing . There are a number of potential hurdles to translating molecular imaging methods from animals to humans. Some approaches that work well in animals – for example, optical imaging – may not be applicable to patients. Multi-modality imaging approaches – for example, combined optical/MR/PET reporters – may be very helpful in this regard. There may be significant regulatory hurdles to the use of some imaging probes in patients. Recent efforts in collaborations between the NCI, FDA, and other organizations show promise in helping to facilitate clinical trials of new probes . Echoing trends in molecular breast cancer therapy, clinical trials of molecular imaging may need new approaches to clinical study design, using measures such as prognosis or response as endpoints, rather than sensitivity and specificity for tumor detection . Cooperative groups and scientific organizations have recognized this need and are beginning to address it through a variety of approaches, including multi-center trials . While somewhat daunting, these hurdles are clearly surmountable by close collaboration between breast cancer biologists, clinicians, and imagers. Early results suggest that molecular imaging will play an important role in translational breast cancer research and the care of breast cancer patients and strongly support ongoing efforts in this area of research. This article is published as part of Breast Cancer Research Volume 10 Supplement 1, 2008: The Scientific Basis of Breast Cancer http://breast-cancer-research.com/content/10/S1.